The first order of business for a flawless installation of your new vinyl is to prepare the surface. 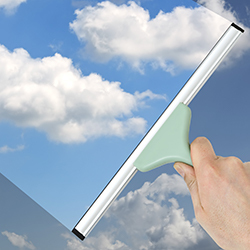 On Glass Applications - It is best to prepare the glass surface by spraying a glass cleaner onto the surface. If necessary you may need to clean the glass surface with fine steel wool. This will ensure any topical contaminants are removed from the glass surface. Follow this step with a final spray of glass cleaner, wipe dry with a clean lint free cloth or towel and proceed to the application process. Polyethylene (plastic) Surfaces - Wipe entire surface with rubbing alcohol or other mild solvent. If your plastic surface has a plastic protective covering, remove and wait 24-48 hours for resins to evaporate and dissipate. This process must be observed or you may risk the chance of bubbles forming in your lettering later. Proceed to application process. Painted Surfaces (Automotive or Household) - Vinyl can be applied to automotive painted surfaces by first using rubbing alcohol or other mild solvent cleaner to remove wax and other road debris. Spray glass cleaner over surface and wipe clean. Interior painted walls and surfaces must be cleaned with a mild soapy solution or paint manufacturer recommended cleaner.